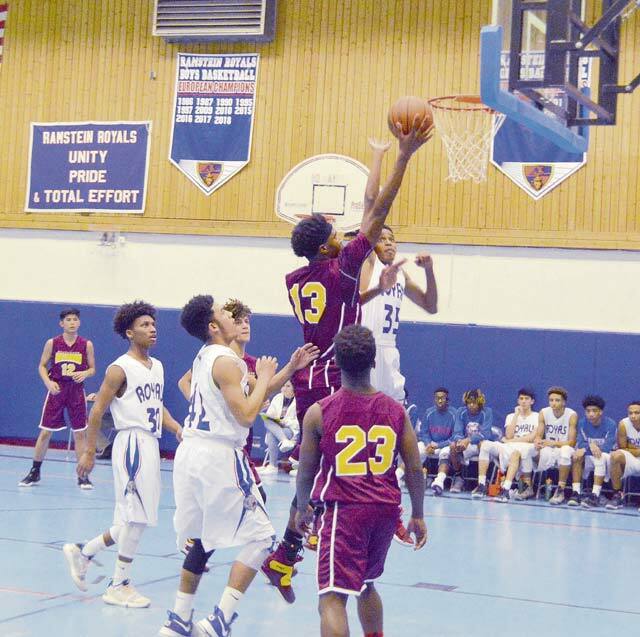 It was a perfect 8-0 weekend for the Ramstein and Kaiserslautern boys and girls basketball teams as they hosted Baumholder and Lakenheath on Friday night and Saturday morning. Kaiserslautern’s girls defeated Lakenheath 37-17 and Baumholder 35-16 to remain undefeated. Ramstein’s girls held the opponents to a combined 23 points in beating Lakenheath 50-16 and Baumholder 47-7. Kaiserslautern’s boys defeated Lakenheath 62-59 in a thriller and Baumholder 53-14. The unbeaten Ramstein’s boys defeated Baumholder 80-56 in an exciting game that was much closer than indicated by the final score and then defeated Lakenheath. For Baumholder, it was an eye opener. A Division Three team, the Buccaneers, by the geographical luck of the draw, are facing several Division One teams this winter. They compete well with schools of equal size, but stepping up to play the two largest schools in the league proved to be a huge challenge. But, because they love to compete and see what their players can do against top competition, the Baumholder coaches love playing the bigger schools. On Friday, Baumholder’s boys got the opening tip, but immediately turned it over, and it could have been an omen of what was in store. But nobody told the Buccaneers boys that that was how the script should have gone. 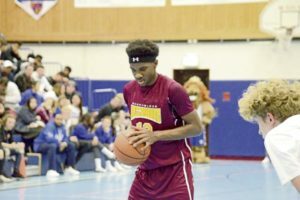 Led by all Europe sophomore Chandler Pigge, the Bucs went toe to toe with Ramstein and led 20-18 at the end of the quarter, paced by Pigge’s seven points and Isiah Daep’s pair of three pointers. In fact, for twelve minutes, the Buccaneers were the better team, causing Ramstein Coach Andy O’Connor to bench the starters for a while to light a fuse and inject a little spark under his experienced team. He was concerned that the Royals gave up 20 points in the first quarter. Pigge was phenomenal. He lit up the gym. His statistics were stellar – 33 points and double figures in rebounds and assists. But it was the way he did his job that was mesmerizing. Ramstein’s defense was an aggressive, on-the-ball zone that spread the court. Pigge, who touched the ball on nearly every Baumholder possession, would often snag the defensive rebound, bolt up the court, his eyes up and searching, while the Ramstein defense had to sprint back and try to stop his progress. Armed with an explosive first step, an ankle breaking crossover, handling the ball like it was on a string, and extraordinary court vision for a 15 year old, the lefthander either threw a crisp pass to his teammates, who often times were surprised by the arrival of the ball, or blasted his way to the basket for the score. If he missed, he kept after it until it went in. He was relentless. Ramstein had no answer for him. 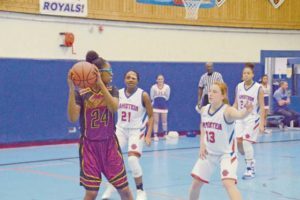 The Royals picked up the pace in the second quarter, became more aggressive and disciplined offensively, went after Baumholder on the inside and started hitting some of their outside jumpers. Led by gritty point guard Jerrod Little taking charge of the offense and Jason Jones hard work and grit on the offensive boards, playing his first game of the season following an injury, the Royals took advantage of a four minute Buccaneer scoreless spell and gradually increased the lead to 37-30 at the half. In the the third quarter the Royals finally took control of the game. Defensively, Ramstein forced five straight turnovers to start the half. A Royal layup, a three pointer by senior Gabe Fraley and back to back follow up baskets and free throws by Jones made it 46-30 before Baumholder could score again. Pigge scored eight straight later in the half to cut it to seven, but Fraley, who will be playing his college basketball in the state of Maine, Jones and Little, who got to the basket at will in the second half, made clutch baskets to seal it for the Royals. The last six minutes were all Ramstein as they finished the game with the 80-56 final score. Little finished with 20 and Jones 18. Stephen Christmas added nine for Baumholder. On Saturday, Baumholder took on Kaiserslautern, the second largest school in the league. The Raiders started aggressively on offense, took the ball directly to Pigge in the key, and either pounded the lay up or passed to a wing resulting in two straight threes from junior Isaak Pacheco. 6’4 junior Tre Dotson stole a pass at half court and threw down a monster slam dunk. Defensively they packed the lane with a 2-3 defense and paid particular attention to Pigge. He was forced to give up the ball, unable to get into a consistent flow and the Raiders kept him off the offensive glass. Pigge got into quick foul trouble and picked up his fifth at the two minute mark of the second period. From then on, it was like someone let the air out of the gym and the whole mood changed. Kaiserslautern did whatever they wanted to do and Baumholder had to fend off the onslaught without their leader. Without Pigge, the Raiders stayed in their tight 3-2 zone defense, sealing off the lane and contested the Buccaneers’ outside shots, which were not falling. The Buccaneers were held to three points in the second half and the final was 53-14. Pigge’s excellence is no secret to the league’s coaches. Coach Corey Sullivan knew he had to focus on ways to stop him. “On Saturday I certainly wasn’t going to let Pigge get into the key. He’s so good. It is easier to say than do. Our kids executed the plan from the tip which made the difference,” he said. But on the flip side, the coaches also know about Kaiserslautern point guard Ervin Johnson and have to prepare for what he can do. The league has an abundance of excellent point guards and Johnson is among the best. He gives the Raiders what they need, be it scoring, defense, passing or, in the case of the game with Baumholder, leadership. “Coach tells me to be a leader,” he said. “He wants me to be disciplined and show some intensity. I use my speed to my advantage. Against Baumholder I saw the openings and I took them.” Johnson set the pace, got them to run when needed and slowed them down when necessary. It all starts with him. It was his steady hand that proved to be the edge against Lakenheath as he hit a three pointer and a lay up late in the game to secure the three point victory. But the opponents know they cannot focus on just Johnson. Each night it is someone else who steps up to lead. On Friday against Lakenheath, it was reserve Brandon Morris that was the spark to hold off the Lakenheath charge. Lakenheath came into the game without a league victory. Sullivan said he and the Raiders were not as prepared for them as they should have been. “They did surprise us. I’ll take the blame for that. They have an excellent post player (Daniel Oleman). I was told he had moved to the wing so we didn’t do enough prep for him inside during the week. Sometimes you have to go by what you know, sometimes you have go by what other coaches tell you. You can’t go to England to scout so you have to trust people. I didn’t trust what I knew enough,” Sullivan said. Oleman scorched the Raiders with 21 points, most of the points coming off of nifty post moves. But he does trust his team and relied on its ability and resiliency to stem the tide when things were not going their way. “It was a very close game. Both teams got up big and had their chances to knock the other out. For us the difference is when we started to actually play together defensively and followed our schemes. We came out after half and really clamped down as a team defensively,” Sullivan said. In Friday’s girls games, Ramstein defeated Baumholder 47-7, holding the Bucs to just one field goal. With just seven girls on the team, Baumholder started out at a disadvantage. But in spite of being outmanned and playing against teams with much more experience, they played hard throughout and carried themselves in a mature fashion. If they were frustrated, they did not show it. Ramstein was led by Alexis Tri with 24 points. On Saturday, Baumholder shot better but fell 37-17 to undefeated Kaiserslautern. The Raiders were led by La’Jhanique Brown with 14 points. She also dominated on the boards. Rebecca Moon had five points, including a three pointer in the fourth quarter. The Raiders played much of the game without one of the league’s outstanding players, guard Emanjanae Hawkins. Hawkins rolled her ankle during pregame warm ups. She played a few minutes in the second quarter but did not score. On Friday, the Raider girls turned the screws on Lakenheath to come back to win 37-17 after trailing after eight minutes. Brown again was the leading scorer with 15.